Report Finds Bahrain Used Torture To Deal With Protesters : The Two-Way The king pledged to heed the recommendations of the report, but just as the report was released, security forces continued their violent crackdown on protesters. 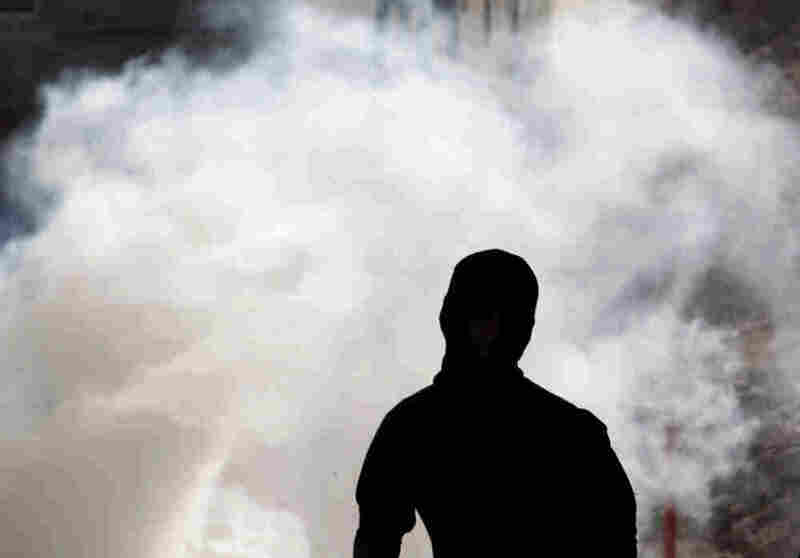 Anti-government protester runs away from tear gas fired by riot police Wednesday in A'ali, Bahrain. An inquiry into how the government of Bahrain handled an uprising earlier this year found that King Hamad Al Khalifa's security forces used "excessive force" that often times amounted to "torture." The Gulf island state's government pledged there would be no immunity for anyone suspected of abuses. "All those who have broken the law or ignored lawful orders and instructions will be held accountable," a statement said. Tension mounted in the hours before publication of the report, and police fired teargas to disperse protesters, with one man killed in unclear circumstances. A photojournalist was briefly detained. Clashes broke out in Aali, south of Manama, the capital, after a 44-year-old man died when his car crashed into a house. Demonstrators said he had swerved to avoid security vehicles. If you don't remember, Bahrain was rocked by protests earlier this year. Protesters first demanded a constitutional monarchy, but as the government cracked down on dissent, protesters demanded a change at the top. Bahrain is a western-backed monarchy. The United States has a naval base in the country. The protests came to a head in March, when the Gulf Cooperation Council sent its troops to the country to put an end to the uprising. The report (pdf) is 500 pages long, so we've only given it a quick skim. One of the more stunning parts, we've found is the description of the five deaths the commission found were attributable to torture. Among the causes of death: heart attacks and "hypovolemic shock," which according to the NIH, is a "condition in which severe blood and fluid loss makes the heart unable to pump enough blood to the body." The New York Times reports that the king spoke in a televised news conference before the report was released and promised "that officials involved in abuses during the crackdown would be held accountable and replaced, and he pledged to heed the report's findings." But as Toby Jones, a professor at Rutgers University who has followed Bahrain protests closely, said on his Twitter account, the crackdown continued as the report was made public. "Good grief, as we analyze whether BICI offers way forward, Bahraini security carrying out business as usual," Jones tweeted. "Can it be any clearer?" -- BICI Report Uncovers many Medics' Crimes, which blames doctors for spreading misinformation about the protests. -- BICI report shows crimes against Sunni people by demonstrators, which says the report finds "serious crimes carried out by the demonstrators in Bahrain."